You know how most races provide encouragement you to keep going? Aid stations are set up to give the runners the support they need and get you moving. Not us. 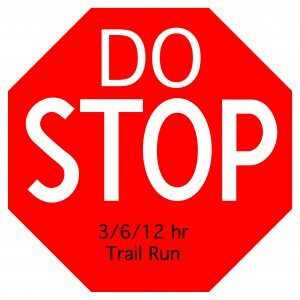 The Do Stop trail race wants you to come out to Bremond, TX, to start a nice long day of running on a gentle 2 mile loop. You can choose to run for 3, 6, or 12 hours. We’ll give out medals for your greatest distance achieved. 64 miles and 100 Miles will receive belt buckles. Along with medals, each participant will receive a prize just for coming out. The 24 Hour Race will start Friday night at 7:30 PM and end Saturday night at 7:30 PM with the 12hr Runners. The 12 Hour Race starts at 7:30 am. You shouldn’t need a headlamp because sunset won’t be until 7:30 pm. The 3 and 6 hour races start at 8:00 am. 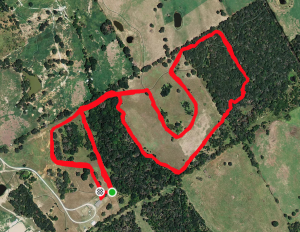 The course is on easy trails with a small section of easy single track. There is about a 60 ft difference between the low sections and the high sections which will have you making the climb 4 times.